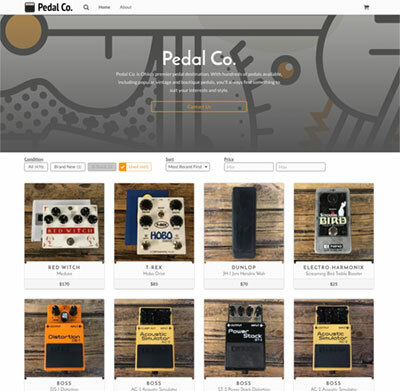 With Reverb Sites, inventory from a seller’s existing Reverb.com shop is automatically synced and all orders are managed through one dashboard. When an item sells in either location, it’s marked as “sold” -— no extra imports, double sales, or wasted time. To build and strengthen their brand, sellers can choose from several professionally designed, mobile-optimized website themes. Once a template is selected, the Reverb Sites platform auto-populates information from the user’s Reverb.com shop and allows the seller to further customize the site with logos, pages, photos, videos, and more. Reverb Sites joins a host of other services and tools created by Reverb.com to make the marketplace the easiest place to sell music gear online. Among other tools and services, Reverb.com provides a Price Guide, which aggregates real-time transactional info to help users understand the value of the gear they’re buying and selling, and Reverb Bump, which allows sellers to promote their listings for a small fee. The Beta version of Reverb Sites is currently available and the service is scheduled to launch in spring 2017. For more information, go to www.reverb.com/sites or visit the Reverb.com team at the 2017 Winter NAMM Show booth #4368. You can also learn more about Reverb Sites and other Reverb seller tools at COO Dan Melnick’s NAMM presentation, “Reverb.com: New Seller Tools to Grow Your Business,” on Thursday, January 19, at 1 p.m. PT in the Anaheim Convention Center’s NAMM Member Center. Reverb.com is the online marketplace to buy, sell and learn about new, used, and vintage music gear. Since launching in 2013, Reverb.com has grown into the world’s most popular music gear website with more than eight million monthly website visits. At any given time, the site has roughly half a million listings ranging from electric, acoustic and bass guitars to effects, studio gear, synthesizers, drums, DJ equipment, orchestra instruments and more.